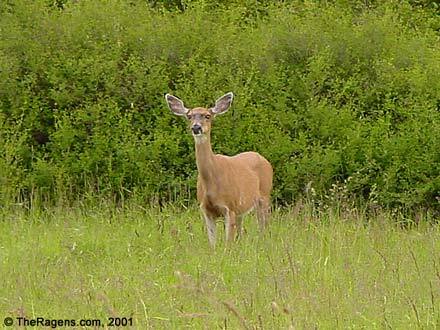 Deer Photo From TheRagens.com, June 2001. Photograph Notes: My father and I were just about to drive through the main gate onto Pile Point when, about 40 feet away, we surprised this black-tailed deer who had been grazing at the roadside. She just watched us, without moving, as I took this picture from inside the car.